This week’s worksheet concentrates on the middle of the story. Why not the beginning or the end? Well, in my experience these are the easiest parts. You know who’s involved and what you want to happen in the end. But the middle is the stinking swamp you need to traverse to get there. The middle is where all the trials begin. 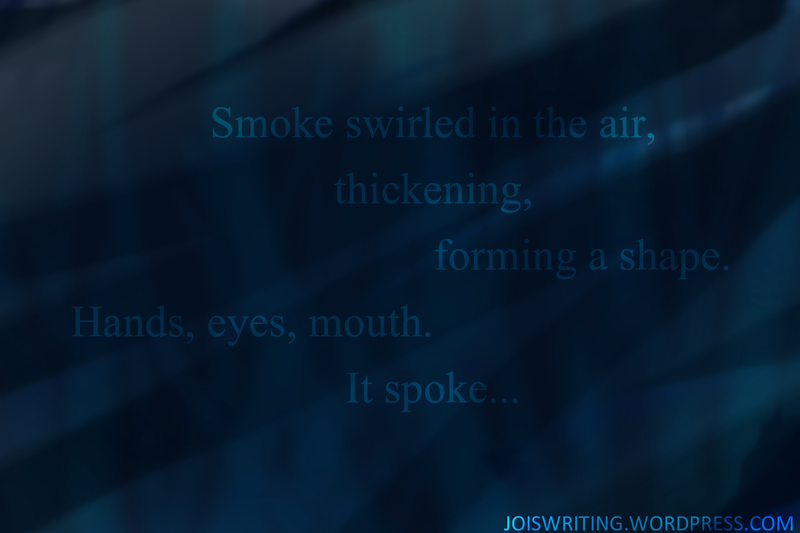 Smoke swirled in the air, thickening, forming a shape. Is it a ghost? A mirage? Something far more sinister? Link to your story in the comments or respond in a new post and I’ll reblog my favourite one. So, where exactly is your plot taking you? What happens next? What is this story about? It’s time to think about plot. Never forget this: What you write this month will not be published. Not never, but certainly not in the form that it comes out on November 30. So with that in mind, go mad! Add in hundreds of characters to that party scene, name each of them and describe what they’re wearing, eating and drinking. And then move on and never look at them again. Or, if your scene lacks drama, snowstorm! (But my story is on a spaceship… Doesn’t matter. I said, SNOWSTORM!) You’re in control for this month. Let your inner child write your story with crayons! It doesn’t matter if it doesn’t make sense, or if it’s unnecessary, they are all words and they all count. Every single one. Or, for those who find it hard to turn off their inner editors… Rewrite. Rewrite the same sentence ten times if you want to. But always start a new line, never delete. And type each word by hand if you want to avoid feeling like you’re cheating. All the words count. You wrote them. And dream sequences are awesome when you’re stuck. Literally anything can happen without affecting your plot. And look at all the lovely words. If you really want to publish your story, you will have to draft and redraft anyway, so don’t let the first attempt zap all the fun out of the experience. Don’t be afraid of writing the impossible or the improbable or the downright loony. Have fun. This is Harvey, one of the only friends I let dribble on me. I would love to know what’s going through his mind sometimes. 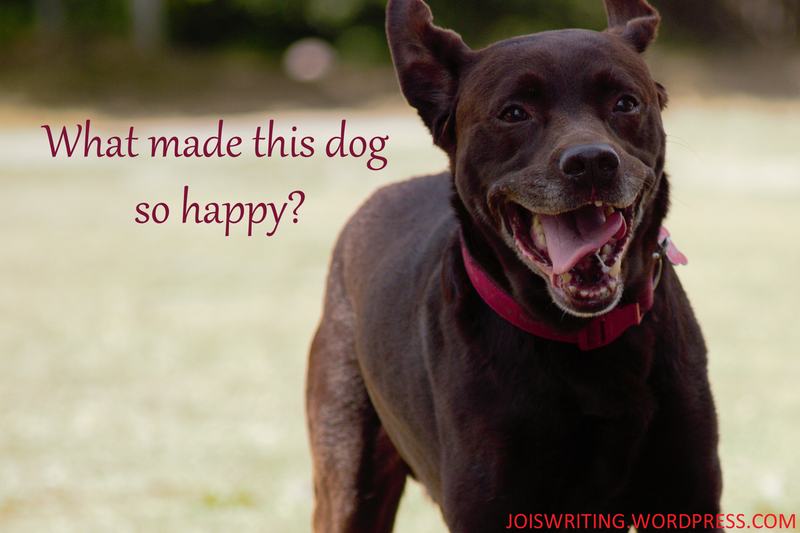 What has he seen that makes him so happy? Link to your story in the comments or respond in a new post and I’ll reblog my favourite one. I’m going to die. This is going to be my last night on this planet. Topi drags me into the shadow of the warehouse. It’s like water to a man on fire. But they’re still coming. I can hear them. Then darkness. All encompassing, pure and unconstrained darkness. Topi pulls me forward and I stumble. I have never felt so helpless. The slimmest sliver of light creeps into my vision. I am not blind. I am not dead. I force myself to breathe. We keep moving. Topi leads. Of all of us, Topi is the most resourceful. He makes gifts for us when we need encouragement, tokens for us to remember those we’ve lost and all manner of makeshift survival equipment. He made paper flowers for Anna one time. I don’t remember the last time I saw proper flowers. Topi’s solution is such an obvious one that I wonder why I couldn’t think of it. I shouldn’t have panicked. I look down at my feet, still illuminated by the dying daylight. Above us, Topi’s blanket is shielding us from the sun. We shuffle forwards, looking for somewhere safe to wait.